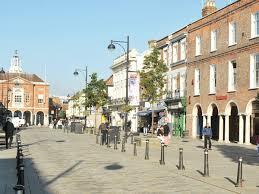 100% IT Recruitment are IT recruitment specialists in High Wycombe. 100% was founded, and still to this day, have our head office located in High Wycombe, 15 years on. Originally on the West Wycombe Road, we then moved to larger premises on London Road before moving our current Head Office to Ibstone House in Stokenchurch, High Wycombe. It’s a special place for us here at 100% and we have been able to become key, trusted suppliers for a large percentage of businesses in the area with a particularly strong presence on the Cressex Industrial Estate, Knaves Beach and in the Town Centre itself. Recruiting for IT professionals and specialists in High Wycombe is not easy as many businesses have found. Neighbouring towns of Slough, Aylesbury and even Uxbridge all enjoy a much larger pool of IT Candidates, from Software Developers and Testers to Helpdesk Engineers, IT Managers, Project Managers, Field Service Engineers, 1st, 2nd and 3rd Line Support Engineers. So, our customers have found it vital to have a truly local agency such as 100% IT Recruitment, who have a vast local knowledge of IT recruitment specialists in High Wycombe. We know many of the local Engineers and Developers with different industry backgrounds. Perhaps you need someone from a Managed Service Provider, or an understanding of the financial marketplace? We are able to spread our vacancies via word of mouth as well as advertising which is just as, if not even more effective. Why not have a look at what some of our local customers say: Referrals for 100% IT Recruitment from the local area. If you have a requirement for IT recruitment specialists in High Wycombe, feel free to call us for a confidential chat about how the consultants can help you fill your permanent or contract IT position. We look forward to working with you to fill your IT jobs, call us on 0844 8794523.